Jay Z tells him The Resistance is more important than blacks behind bars. Rapper Meek Mill (Robert Williams) posted an Instagram photo of himself riding dirt bikes with some kids in Manhattan last year. He wasn't wearing a helmet, so the NYPD decided to bust him for reckless endangerment. That charge was later dismissed, but Philadelphia judge Genece Brinkley, acting against the recommendation of the Assistant District Attorney and Probation Office, cited it in sentencing the hip-hop star to two-to-four years in prison for a parole violation related to a 2008 gun and drugs conviction. Since he was first accused of selling crack in 2007, a charge he denies, Mill’s been on parole nearly a decade, a long period that many feel is attributable to Brinkley's obsession with him, perhaps for racial reasons. Meek Mill’s spent about $30 million in legal fees, despite never having been convicted of a serious crime, so he has an acute interest in the reform of a criminal justice system that's singled him out. Last Friday he had an opportunity to act on his feelings by joining a panel discussion on prison reform at the White House, but he cancelled at the 11th hour, reportedly after hip-hop mogul Jay Z (Shawn Carter) convinced him that Trump was radioactive, regardless of the cause. “Problematic” is the word progressives often use these days for such situations. The Jay Z phone call never happened, according to Meek Mill, who explained he was bowing out because the focus had turned to the President and himself, which “might take away from creating a positive result from today’s discussions.” In other words, he was afraid of becoming perceived as the new Kanye West by associating with known racist Trump, even though Trump’s actually trying to do something that will help black people more than any other group, and even though his participation would in no way be a tacit endorsement of our self-proclaimed genius president. Mill wouldn't be wearing the MAGA hat like Kanye, nor would he be talking about sharing “dragon energy.” Jay Z’s normally all about taking care of business, but he's got a blind spot here. Just the thought of breathing the same air as Trump gives many Democrats the vapors. 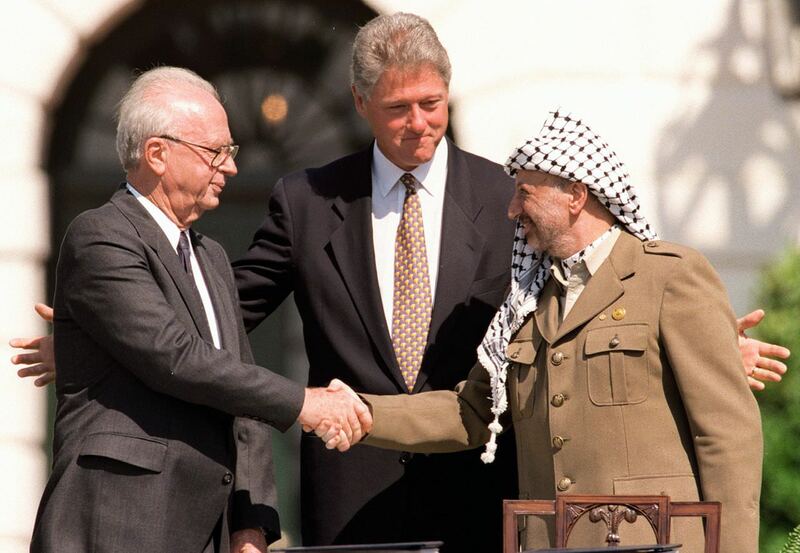 That’s how former Israeli Prime Minister Yitzhak Rabin felt about PLO Chairman Yasser Arafat in 1993, but still he went to the White House to sign the Israeli-PLO peace accord. He even begrudgingly shook his enemy's hand, although not without some serious coaxing from Bill Clinton. The point is he was serving a cause that trumped his own personal animosity. Ever since Keith Olbermann became the spiritual leader of The Resistance with his GQ video series consisting mainly of lunatic ravings about Trump being crazy and a danger to American democracy, The Resistance has taken on cult-like attributes. When you take someone who’s nearly foaming at the mouth seriously, you've crossed that line. Olbermann recorded his last rant in November of last year, informing his fellow Trumpophobes that his work was done and that their extended nightmare was soon to end with Trump's removal from office. He was wrong, and the Resistance handles their disappointment mainly with empty gestures rather than positive action. Politics is the art of the possible, not the pleasant. It may require standing next to a repulsive bigot, or worse. Insisting on ideological purity means that nearly everything becomes impossible if you're a Democrat. The criminal justice system is a disgrace, and it saves its worst inequities for black people, but an influential black person who’s been trapped in it can't be a part of the fix because it would be perceived as working for the other team. That's tribalism at its worst. When you think of the Clintons and the criminal justice system as it related to blacks, you recall the 1994 crime bill that Bill signed which ended up incarcerating so many of them. President Obama, although he used his executive order powers to make some prison reforms, never invited Meek Mill to the White House to deal with an issue near the top of the Black Lives Matter wish list. If Jay Z and Meek Mill think it's better to wait for the Democrats to take the House in November, any criminal justice reform bill under their stewardship might very well get loaded up with so much progressive baggage that it wouldn’t get passed. CNN’s Van Jones, who moderated the White House panel discussion, is a liberal black man who gets it. He understands that right now's the time to act. Trump's called for bipartisanship and has said he wants a bill on his desk. His proposals deal mostly with improving prison conditions, doling out extra privileges, and preparing prisoners to re-enter society. It falls short of the comprehensive sentencing reform the Democrats want, but it's progress that can be the start of future reforms. Jay Z, Meek Mill, and The Resistance have taken themselves out of a game because their priorities are selfish. They're letting down for reasons that look petty at the moment.